I am a grain geek. Bins filled with hard red wheat berries, oat groats, rolled oats, rye berries, medium ground white wheat flour, anything with a Fairhaven label excite me. The idea of a 3-day conference on the 10,000 year relationship with wheat makes me swoon. The textures, slight variations of earthy color, the potential alchemy, combine to give culinary and intellectual satisfaction. However all this, the single grain that will always draw me in, whether in a bakery, a deli case, on a website or store shelf, is Emmer Farro. I learned of emmer after searching for locally grown wheat and wheat flour. I was in the midst of my quest to Not Buy Food From China, a journey that revealed many negative things regarding our food systems in America. Easily mired in unpleasantries, my discovery of Bluebird Grain Farms lifted my eyes and heart. There was good afoot, people choosing to hoe a harder row for the well-being of humanity. Emmer is an ancient grain, dating back about 17,000 years, the mother grain of modern durum wheat. It is a simpler grain than the highly hybridized modern wheat, containing only 28 chromosomes, rendering it high in protein but much lower in gluten than its modern counterpart. Bluebird’s seed stock of Triticum dicoccum came from the World Seed Bank 30 years ago. Sadly, since emmer is low in gluten, it is not an ideal flour to use for my sourdough bread. The long fermented dough needs the strength of gluten to get it through that final push to a beautiful oven spring. I have tried combinations of flour with emmer, but don’t yet have the ability to produce a satisfactory loaf. Emmer is, however, perfect for pastry, cookies, my Neapolitan-type pizza, and are delicious as cooked whole berries. 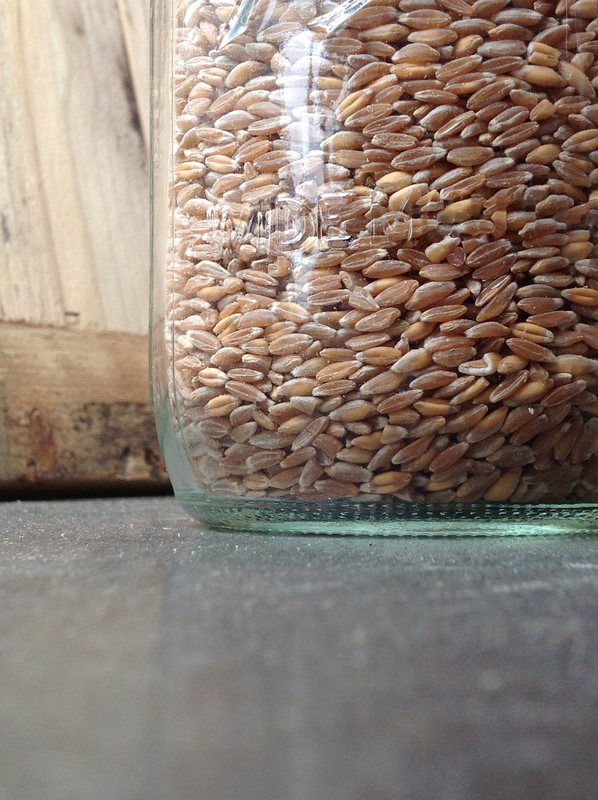 Emmer and the hard red wheat grown by Bluebird have been my pantry favorites. At Christmas, per my request, I received Sally Fallon’s book, Nourishing Traditions. I have friends and acquaintances who spoke highly of the book and a few simple internet searches revealed that many others felt the same. I figured there was gold to panned, information to be gleaned. I dove into the read, as is my usual way, but found myself mired yet again, this time in the “fact” that all grains are killing all of us, slowly but surely, and the only remedy is to soak the flour, just-ground whole wheat only, for 12-24 hours, to eliminate the toxins that are found in grains. Wanting to do what’s right or best nutrition-wise, I began soaking/fermenting flours before finishing a recipe; if we wanted pancakes on Saturday morning, I better have the batter soaking before 8PM Friday night. My poor family. Not all the recipes I tried worked: the soaked flour biscuits were hockey pucks, and the soaked flour bagels looked mottled and grossly misshapen. Everything had a pronounced sour overtone. I learned that using flour made from sprouted wheat was free of toxins, so I began sprouting the berries, dehydrating them before grinding into flour. This flour had a sweeter taste but made it easier to make cookies and biscuits and pizza. My devotion to the 2-gallon jars of upturned, rinsed grain, and the daily growl of my Nutrimill grain grinder were constant. As hard red wheat is less costly, and since sprouting and soaking was making the grain healthier, I moved away from emmer, using only the stronger grain in an all-purpose fashion. In the midst of this new grain regimen, my sister was diagnosed with Stage 4 Breast Cancer. Overnight her diet became soy-free, corn-free, gluten-free, dairy-free, most meats-free, ground nut-free, sugar-free, and anything remotely resembling estrogen-free. In a blink, my internet searches became variations of How To Eat For Cancer, and where my new-found practice might fit in. As with any search of the interwebs, I found conflicting advice on every topic I looked for. I quickly became further mired, now learning that most foods would certainly kill most of us. Grain is healthy vs grain will kill you. Soy is your best friend, I mean fermented soy is your best friend, I mean, soy in any form will kill you. Sprouted grain is perfect for your body vs sprouted grain still contains those little wheat toxins and will not only kill you, but will make you obese before you die. Only eat raw. Only eat vegan. Only eat the Nourishing Traditions way. I don’t remember at just what point, but I became angry with food, mostly angry with grain. Around this time, I began to realize that I didn’t feel as good as I had at Christmas. I had eaten more holiday foods that I normally avoid, and I definitely had partaken in my share of emotional eating regarding my sister’s health, but this was different. 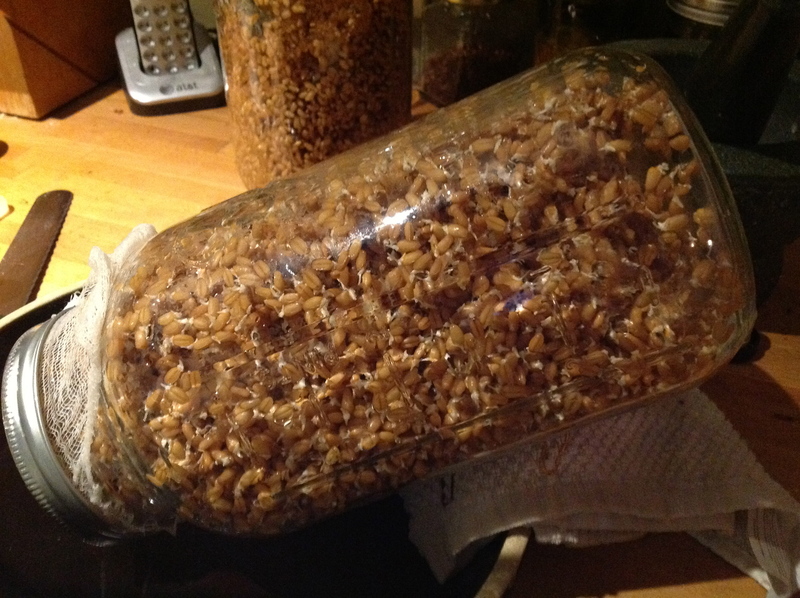 My naturopath set me onto some supplements but the chief alteration I made was to stop the hyper frenzy of grain preparation. As I focused my thoughts and awareness, I realized we had begun eating more wheat products because of the “healthy” way I was preparing them. Our fruit and vegetable and true protein consumption had gone down. In a pattern predictable for me, I had brought my body out of balance. For the last two months, I have worked to correct these nutritional missteps. I solicited advice from a nutritionist and educator who I know and respect. She was gracious to share some of her family practices, some of her views on grain preparation/consumption. She was careful to acknowledge that these practices are what work for her and her family, that everyone’s body is different, having different nutritional requirements. Her words brought a deep breath of very fresh air and freedom. I am feeling settled again. The bread I make is with 80% heritage whole wheat that I usually grind, and 20% white unbleached organic flour. The dough has a high moisture content and the ferment is long. Bread makers the world over, who work to follow old traditions, make bread this way. While this bread is digestive-friendly, we don’t eat it as often as we were. For the weekend day when we have pancakes or waffles, I use emmer flour. As emmer makes great pasta, I aim to make my own rather than purchase from the store. Occasionally I make emmer raspberry scones, perfect with a scrambled Beatrice egg for breakfast, or a kuchen with seasonal fruit. An emmer berry salad with diced tomato, cucumber, onion, and parsley is a refreshing lunch or side dish. We don’t have more than one grain per meal, but include meat from well-husbanded animals, and lots of chemical-free fruits and veg. Not all grains are equal. Not all wheat grains are equal. The grain grown by Bluebird, and farms like it, offer a path to ancient foods, produced without pesticides, herbicides, and stored without fumigants. This food is much closer to the grain that humans first adapted to eat, while far removed from the wheat so many are now intolerant of. Additionally, not all bodies are equal. I have to listen to mine, encouraging those I cook for to do the same. It would seem the grain of Sumerians, Pharaohs, and Romans is making a comeback. Word on the street has it that Chad Robertson of Tartine is working on a sourdough loaf utilizing ancient grain like emmer. This will be the next book I ask for at Christmas.